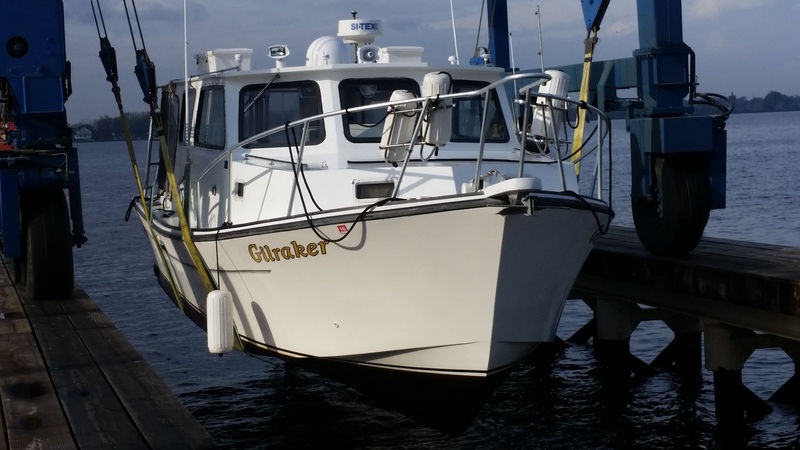 Before we do any traveling this year on Gilraker, we decided to see what new paint would do for her. It’s been quite a job. Every screw and bolt was inspected, removed if not needed and holes plugged. Then the work started. Troy sanded and sanded; by hand or with a small electric sander. Even for a small boat that is more work that either of us had anticipated. He’s been at it for a month now. Last week the rails were taken off as well as the rear over head frame. They removed a water tank from the cockpit and found water damage in the spaces under the storage boxes on the roof as well. The propane tank is being replaces as well for cooking gas. I don’t think I’ll recognize her when she is finished! She was put inside the paint shop the other day . … . . Oh I should tell you about the great folks who have been wonderful about helping us haul her out, re-paint he hull and help Troy in the repairs and modifications that are being done. He is doing as much as he can to keep our costs down. Bridgeton Boat Works is a new boat maintenance facility in Bridgeton NC. It is run By Ginny and Mike who are as friendly as they are helpful. They have the resources and experience to help anyone in a basic bottom job, engine work or a re-paint. If you want to do some of the work yourself you can or you can also hire outside help (fee required) to do the work. So I am hoping that there will be some additional storage for kitchen ware and meal preparation tools in her. Perhaps a place for food as well as clothing. We’ll see. … . I hope that we can travel a bit once Gilraker is finished. Maybe by the end of summer!